Veligandu Island Resort & Spa is the gem of the Indian Ocean. A whimsical tropical paradise of swaying palm trees, powdery sand beaches, crystal clear water and exuberant coral reefs, teeming with abundant marine life. This lush island escape offers privacy and tranquillity that nourishes one’s wellbeing. Surrounded by a beautiful lagoon, the island stretches over about 22 acres and is a scenic 20-minute flight from Velana International Airport. 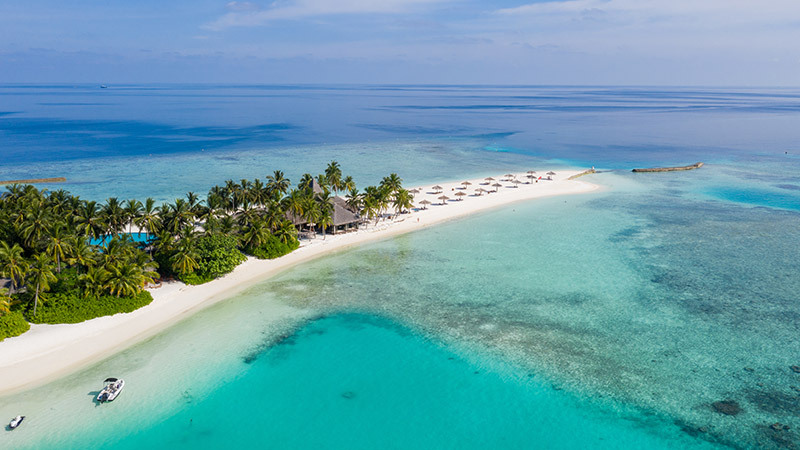 Scroll down and discover more about the island itself, our fantastic facilities and their exact location on the map, as well as our sought-after awards’ portfolio and the answers to the most commonly asked questions from our guests. Welcome to Veligandu Island Resort & Spa, a Maldives beach resort that captures the essence of paradise. Familiarise yourself with the location of all facilities at Veligandu Island Resort & Spa with our interactive map. Veligandu is a proud recipient of multiple accolades for service excellence. Take a closer look at our awards to date. Facilitate your travel arrangements with our quick list with the most common questions we receive from our guests.